The Momo challenge, a viral hoax sweeping the internet, encourages kids to speak to “momo” via WhatsApp. Momo allegedly tells people to do dangerous things, including self-harm. 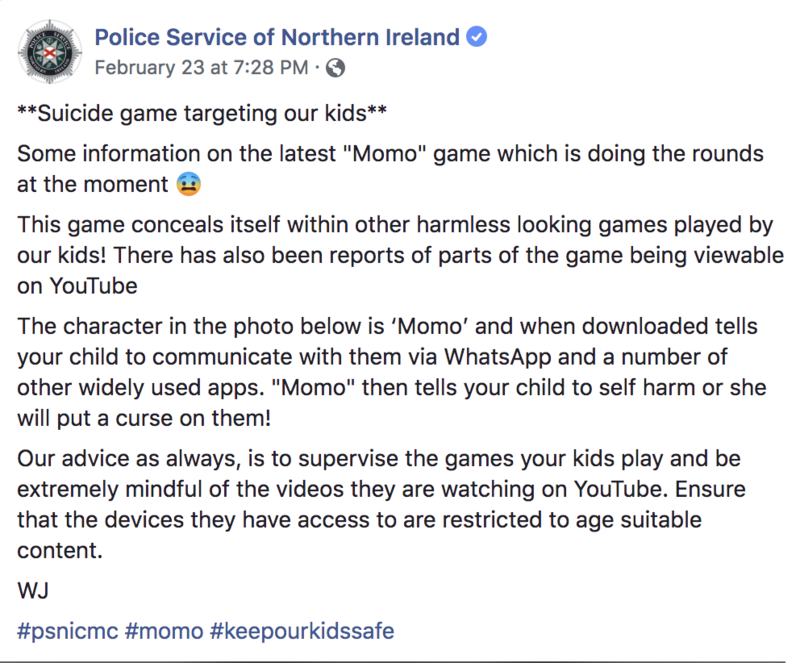 Momo has also reportedly been found in YouTube videos targeted towards children, concerning parents. A viral game called the Momo challenge is spreading around the internet and worrying parents. The Momo challenge, which is widely known to be a hoax, is popular among young teens and children. It involves this image, depicted below, which is known to those who participate as Momo. The Momo image is actually a statue made by a Japanese artist, and it is not known how it came to be attached to the Momo challenge. Those who have participated claim that Momo can be reached by texting a certain number on WhatsApp. However, most people who text the rumored numbers that connect to Momo don’t actually get a response. However, those who do say they reached Momo, claim that they receive incredibly creepy messages and photos. Momo claims to know personal information about the texter, and then encourages the texter to do dangerous activities and record themselves doing it for proof. Some of these activities can allegedly include acts of self-harm and suicide. Momo rose to popularity in July, 2018, which is when many initially deemed it a hoax. ReignBot, a YouTuber who often posts content exploring creepy trends, made a video diving into it. In her video, she claimed that there are three numbers that people use to contact Momo. One of which was Japanese, another Mexican, and another Colombian. However, even the Japanese number, which was the most popular, could communicate in Spanish, making it very popular in Spanish-speaking countries. ReignBot ultimately chalked Momo up to be a viral urban legend, as it is hard to find examples or screenshots of “real” interactions with Momo. However, in August police in Argentina investigated whether or not Momo had anything to do with a 12-year-old girl’s suicide. Additionally, the deaths of two people in India, as well as the deaths of two children in Colombia were reportedly linked to Momo. However, the ties were never definitively proven in any of these cases. BBC also reported that hackers could be behind Momo, using it to get texters’ information, but that has not been confirmed either. Now, Momo is riding a second wave of popularity, as the hoax has spread, specifically on YouTube. Some have reported that clips of Momo are appearing in videos on YouTube and YouTube Kids. The videos specifically sited appear to be episodes of Peppa Pig and Fortnite videos. The thumbnails for these videos appear to be safe, and they begin with kid-friendly content, but partway through, Momo shows up. The images and clips can reportedly be gory, violent, and threatening, and terrify children who see them. Other parents have shared the post, and claimed they will no longer allow their children to watch YouTube. This follows another controversy on YouTube, where clips giving instructions as to how to commit acts of self-harm have been found in children’s videos. Right now, it is unclear if these two are related. Facebook post by the Police Service of Northern Ireland, Screenshot by Rogue Rocket. YouTube gave a statement to CBS on Tuesday, where they said they remove content related to the Momo challenge. Even with this new wave, Momo is still a known hoax and many think that parents are overreacting now.